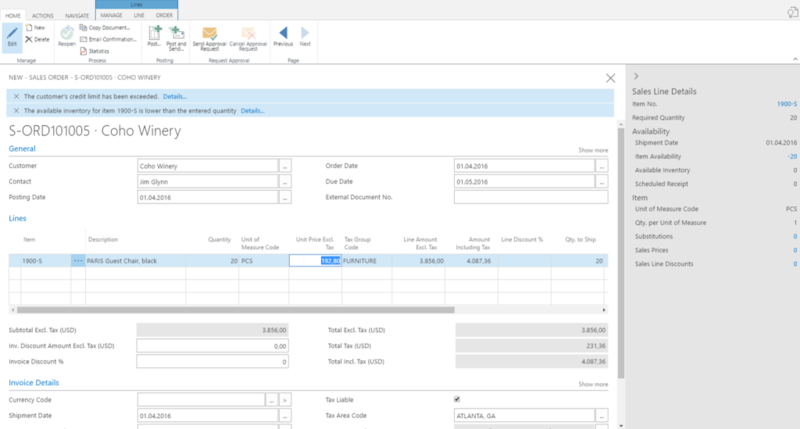 In addition to numerous functional innovations offered by the new version of the ERP system, many of the enhancements in Dynamics NAV 2017 also contribute to a more pleasant user experience. Highlights are the new smart notifications as well as a few improvements to the Web Client. Users can now gain more benefit from non-invasive, intelligent messaging on their user interface that accompanies them through relevant work processes on a context-dependent basis. That means that the user receives information about certain situations and workflows without being disrupted or even blocked in the continuation of his current actions or tasks. This type of messaging supports new, less experienced users in particular in carrying out tasks intuitively without disrupting their workflow. The messages appear at the top edge of the page in a messaging bar – with several notices at the same time in chronological order. The user can then decide whether he wants to discard the communication or choose one of the action options shown. The Web Client has also become a first-class client for desktop users. It meets the requirements of most users of an organisation, whether PC or Mac users. Thanks to the continuation of the improvements of Dynamics NAV 2016 with regard to simplicity, productivity and performance, Dynamics NAV 2017 optimises this experience even further – especially for first time users. For example, new users can use assistants to learn new concepts, be guided by setups and installations or facilitate data input. In addition, revised tool tips display information and help on many fields and actions while the corresponding processes are worked on to the user. Moreover, the use of familiar function keys also helps to optimise workflows. For example, “ESC” can be pressed to end a page immediately or “F5” can be pressed to update data in the browser without having to reload the page completely. In addition to the features described, Dynamics NAV 2017 also offers other improvements, such as the tap and hold action, brick layout and an optimised performance. It also supports more FactBoxes, iOS 9 and 10, Windows 10 Mobile and iPad Pro and offers much more.